I've got a sculptural piece titled Galvanized Hand in '90 Years, 90 Works' at the Sarjeant Gallery, Whanganui. The work was part of my exhibition, The Museum of Inherent Vice at the Sarjeant in 2007. There's some text that goes with the work, written by Senior Curator, Greg Anderson; which I'll post on this site soon. I must say, it's pretty nice to be grouped with Ed Ruscha. I've been working on a more adventurous ceramic piece over the last 3 days - St. John the Baptist head on a platter. I've never thrown a plate before with clay, so I'm getting Paul Maseyk to throw one for me. The head is based on the Gregorio Fernández ‘Dead Christ’ that I post posted about last week. I'm thinking of making a Holofernes companion piece. Also, Paul has his ceramics shop up and running now, so if you're heading along Putiki Drive, look out of the white 'pottery' sign. 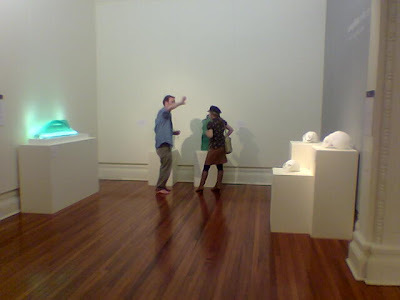 Tao Wells explaining something to JK Russ at the opening of Looking Glass: Reflecting Ideas, an exhibition selected and curated by Grace Cochrane and Greg Donson.